1- Steal all the neighborhood angels. Check. 2- Burn the Christmas cookies. Check. 3- Call 911 repeatedly to get Dad a date. Check. 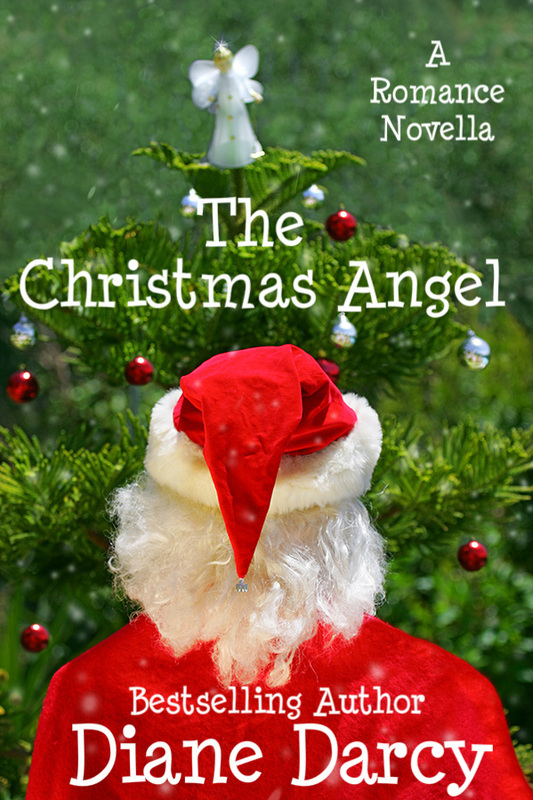 Jessica Ellis, policewoman and reluctant Mrs. Claus, isn't sure what to do when a young thief refuses to stop stealing angels from lawns all over town and refuses to believe she isn’t an angel herself. Busy businessman Matthew Roth is trying to give his son the best Christmas ever, even though the kid doesn’t seem to appreciate his efforts and might even be sabotaging Christmas. Eight-year-old Ty Roth is convinced that Mrs. Clause, AKA Jessica Ellis, is suppose to be his new mom. He’ll find a way to keep her, even if it means going straight to the top of the naughty list...or even to jail. Unfortunately, his dad isn’t interested in getting married again, and Jessica’s starting to believe there isn’t a guy out there who could love a girl like her. Could a nudge from a real Christmas Santa and his enthusiastic assistant help these two hard cases learn to trust again? Can Gabriel perform another Christmas miracle? Santa Claus is coming to town... or someone sort of like him, anyway. As Jessica turned the patrol car around, she wondered how long she needed to live and work in Billings before she wasn’t the newbie-from-back-east on the force. Seven months seemed like an eternity to her. She had no doubt that was why they’d goaded her into being Mrs. Santa. Come on, Jess! Have a heart! The money isn’t just for our police fund-raiser. Half is going to a children’s charity. One of the other officers is donating his time as the photographer, and we were lucky to get a volunteer Santa. We need a woman and you’re available. Heidi, who normally did it, was conveniently pregnant. And what was wrong with a round Mrs. Santa? That’s what Jessica wanted to know. The other female officer was supposedly scheduled to work nights in December. Jessica wasn’t quite sure she believed it. To top it off, the outfit was stupid. She glanced at the accessories on the seat beside her. She had to wear a white wig and gold wire glasses as well as the red and green apron. But she wasn’t putting them on until she had to. And she never should have let her nieces do her makeup. Bright green eyeshadow and glitter on her cheeks? Really? Anyway, shouldn’t Mrs. Claus have a dress that hung to the ground? The puffy little skirt hitting just above the knee looked ridiculous on Jessica’s long-limbed frame. Jessica turned into the residential neighborhood, found the address, pulled into the driveway, and surprised the little thief in the act as he crossed the yard with an oversized plastic angel tucked under one arm. The boy stopped and his lips parted as he stared at her outfit in astonishment. As well he might. His little mouth opened and closed like he wanted to say something, but couldn’t quite find the words. He really was adorable with his blond, windblown hair hanging partway over dark brown eyes and carrying an angel as big as he was. Her heart melted a bit and she couldn’t help a chuckle. It was most likely the dad, and he was cute too. A little over six feet, fit, with short light brown hair, and brown eyes bright with worry. Lucky mom. The guy stared in disbelief at the collection of stolen angels on the front lawn. He finally sighed and shook his head. Jessica blew out a breath. “Yes. Officer Ellis.” She tweaked the shiny material of her skirt. “Fundraiser. Short straw. Don’t ask. And you are?” She was conscious of her Jersey twang and how out-of-place it sounded here in Montana. Jessica inhaled slowly. The boy’s mom was an angel? As in deceased? And the poor little guy thought Jessica was some sort of messenger? Well, that was heartbreaking. She glanced at the dad who looked stricken. She felt the same. She looked at the angels once more and wished the kid could keep them. “Mr. Roth. I’ll let you take it from here.” Jessica turned to go. Jessica nodded. “Sure kid. See you later. In the meantime, be good.” She slid in the car as an elderly neighbor hurried over, his face slightly belligerent. “Can I have my angel back?” She heard Mr. Roth apologizing then shut the door. As she reversed out of the driveway, she glanced back and the boy was still staring after her. He lifted a hand and she waved, put the car in drive, and headed to the mall. No mom, huh? Poor little guy. Matt followed Ty’s gaze as the pretty officer drove away. The glitter makeup and white outfit, combined with the candy cane stockings were interesting to say the least. She had great legs. He might not be interested in a girlfriend, but he wasn’t blind either. “Does she know you were stealing angels?” Ray asked darkly. Matt rubbed his forehead. He could see her saying that. She believed in encouraging creativity and pretty much let Ty do anything she saw as a worthy effort on his part. Of course, Matt would never dare contradict her. She was kind to Ty, met him at the bus stop, cooked dinner for them, and planned Matt’s grocery shopping list every week. Her word was law and she knew it. “Well, don’t listen to everything Mrs. Woods says,” said Ray. “She doesn’t know everything she thinks she knows and she’s going to get you arrested one of these days.” Ray, apparently, had no problem contradicting Mrs. Woods. Ty giggled and the old guy’s scowl melted and he chuckled. It was good to know Matt wasn’t the only one susceptible to Ty’s charm. The creaking of the screen and the yapping of a little dog announced Mrs. Woods. “What on earth is going on out here?” she buttoned her sweater, then dragged a knitting suitcase on wheels behind her. “Ty’s been stealing angels again.” Ray’s tone was accusing. Matt didn’t bother pointing out that they didn’t own a game station. He suspected she didn’t want to give up the TV to cartoons as they would interfere with her favorite soap opera. Matt didn’t dare interfere. The combatants had lived in the same neighborhood for more than forty years, long before Matt and Ty had moved in. Ray made a growling noise and stomped off, muttering under his breath. Ray waved a hand and kept walking, his angel tucked firmly under one arm. She started off down the street, her suitcase thumping on each crack in the sidewalk, and, after a snort or a sneeze, Matt wasn’t sure which, Daisy hurried to catch up, her little legs trotting after her mistress. Matt swallowed. He reached out and took Ty’s hand. “What do you need help with, buddy?” his tone was gentle. Ty shrugged and looked at the ground. “Yeeees!” Ty said under his breath. He glanced in the direction the police car had gone. Ty wasn’t paying attention. He still looked up the street, no doubt thinking about the cute police officer with the candy cane stockings. It wouldn’t hurt to let Ty see her again so he’d understand she was just an officer playing the part of Mrs. Santa Claus. Not an angel. Jessica looked into the restroom mirror and grimaced as she pinned up her hair. Thick and dark, in her opinion, it was her best feature. She tugged on the gray wig, adjusted it, and looked in the mirror again. Great. Now, not only was she alone for Christmas, but, at barely twenty-six, she was old, gray and alone. She sighed, wondered where the thought had come from, and slid on the gold-wire glasses. The final touch was the red velvet apron with the white fur trim. She tied it around her waist so it lay over the top of her fluffy skirt. A glance all the way down to her white boots assured her that she did, indeed, look ridiculous. She turned away, grabbed her purse from off the sink, checked her gun and cuffs out of habit, and decided to quit feeling sorry for herself. She headed into the food court and the enticing aromas made her realize she hadn’t eaten. Unfortunately, she was out of time and would have to pick up a late dinner on the way home. A teenage boy wolf-whistled as she walked past his table. “Nice legs!” yelled his companion. The compliment actually made her feel a little better about the stupid wig and she waved and threw the boys a wide, red-lipped smile much to their delight. As she walked toward the center of the mall, the Christmas decor lightened her mood even more. The evergreens, wreathes, ribbons, and lights must be putting a lot of people in the Christmas mood, because the place was packed. With Thanksgiving over she supposed it was time to start thinking about Christmas shopping. She caught herself looking into stores as she passed, studying the shoppers, rather than the wares, automatically looking for shoplifters and troublemakers. She reminded herself she was off duty, but knew it wouldn’t make a difference. She couldn’t help it. She found the Santa display in the center of the mall, and Santa himself talking to Dean Yoder, a fellow officer dressed in jeans and sweater, and wearing a camera around his neck. Little kids waved at Santa, and when some of them spotted her, waved frantically in her direction as well. She couldn’t help a smile. They were pretty much adorable. She waved in return, but all the little families with their children caused a pang of wistfulness, reminding her that if she’d married Brad, she might have been pregnant by now. Or, more likely, pregnant and divorced, she reminded herself. She sighed. Maybe it was time to listen to Heidi and start internet dating. That actually sounded pretty horrible, but what if she actually met someone? She thought about the little boy she’d met earlier--about his good-looking, single dad--then pushed the thought away. She wasn’t desperate enough to start scouting for dates among the call in’s. Jessica’s brows rose and she wondered if the guy was a priest or something. “Thanks. That’s good to know.” She choked out the words. What was the guy trying to do? Manipulate her into crying? She glared at the old fool. He nodded once and finally turned around and sat down in the chair. Jessica glanced at Dean and was grateful to see he was busy fiddling with his camera and too far away to hear the exchange. The first little kid in line, a little girl with a red and green headband, and an excited smile, slipped forward and onto Santa’s lap. Jessica found herself staring at the top of Santa’s hat. It was pretty sad when even the local mall santa could tell she needed to make some changes in her life. She did. She needed to snap out of it. She’s been just going through the motions for too long now. She wouldn’t have said she was unhappy. Just not happy. What better time than Christmas to change her attitude? Jessica looked around the crowded mall, at all the happy children, the decorations, and she made a decision. She’d been moping for long enough. It was time to have fun again. “Ty, wait up!” Ty ignored his dad and ran as fast as he could, dipping and weaving through shoppers, determined to find Mrs. Santa. He needed to get another look at her. To make sure she really was his angel. He slowed as he spotted Santa in the distance, sitting on a chair, and talking to a little boy on his lap. There was a woman behind him and it took a moment to realize it was her. She didn’t look as impressive as he remembered with her white wig, glasses, and colorful apron, but it was definitely her. He recognized the stockings and the smile. Ty joined the line and waited impatiently. When Mrs. Santa looked his way he raised a hand and waved, but she didn’t see him. What if she didn’t remember him? He blew out a breath and considered sneaking in the back way where the kids were leaving so he could talk to her. But he didn’t want her mad at him so he stayed put. He glanced up to see Jeremy Boucher and Will Stokes from his class at school, hanging over the balcony above and making fun of the kids sitting on Santa’s lap. Ty ducked his head and felt a little queasy. Should he step out of line before they saw him? He knew Santa was a big, fat, fake. Everyone in his class knew that. But what if? Ty could use all the help he could get this Christmas. So again, he wasn’t budging. When it was finally Ty’s turn he walked up and stopped short of Santa. If Jeremy and Will did recognize him, he didn’t want them telling anyone that he sat on Santa’s lap at the mall. He’d never hear the end of it. He looked beyond Santa to where she was passing out candy canes, but she kept talking to the sisters who’d just finished with Santa and still hadn’t noticed him. He could hear Jeremy and Will jeering and making fun of him, calling out his name, and realized he’d been recognized. He swallowed, but didn’t move. This close to getting another look at her, this close to talking to her, and he wasn’t blowing it. The other boys had moms. Ty didn’t. This was too important. Ty was unimpressed. He wasn’t going to be tricked into talking to the old guy, and then find himself sitting on Santa’s lap before he knew it. He started to push past Santa when he saw his eyes twinkle. Ty’s breath caught in his throat. A kid behind him told him to hurry up, Jeremy jeered louder, Ty’s dad call his name, but wide-eyed, Ty studied Santa closely. Ty swallowed and the hair on his arms rose as he got chills. What if he missed out? What if this guy was the real deal? Excitement roared through him as he glanced at her again. “I want a mom for Christmas,” he said quietly. Her name was Jessica. Ty nodded. The guy taking pictures rushed to help and Ty hurried over to see her handcuff a guy on the ground and haul him to his feet. Her wig and glasses had fallen to the ground and long dark hair fell down her back and over one side of her face. He nodded, happy she remembered him. She led the guy away and Ty picked up her glasses and the wig. He glanced over his shoulder to see Santa watching him. Santa tilted his head in Jessica’s direction, then nodded, and Ty’s heart started drumming in his chest as he grinned. He’d know Jessica was the one. He know it the moment he’d met her. She was his new mom. And she was freaking awesome! He looked up to see Jeremy and Will watching Mrs. Santa lead the guy off and thought about how impressed they’d be when she was his. Ty continued to smile. “Yep. We don’t want to do that.” And he wouldn’t. He’d be such as great son that she’d be glad he was hers. Ty didn’t move until Jessica was out of sight. He stowed the wig inside his jacket and stashed the glasses in his pocket. When Jessica came to pick up her things, he’d make sure his dad was there. After all, Santa did say he’d need Ty’s help.